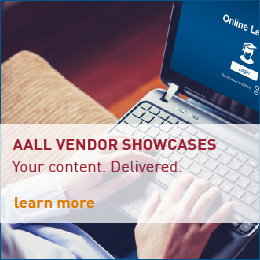 Your AALL 2019 sponsorship illustrates commitment to the industry, profession, and AALL and puts your brand in front of the decision makers who buy your products and services. Increase your exposure and customize your messaging with advertising opportunities that are now part of your sponsorship. This year, showcases will be held in program rooms for one full hour as part of our education program offerings. By Audience: Communicate your support by sponsoring the right mix of AALL programs and events to reach your target audiences. By Advertisements: Promote your brand and gain visibly conference-wide through a variety of advertising opportunities that will drive traffic to your booth, showcase your product, and more. Please contact Vani Ungapen, AALL executive director, at vungapen@aall.org or 312.205.8016.